There is no mistaking that you are on island time when you step foot in Hurakan Villa. Each room has large, wooden beam cathedral ceilings that give the rooms their ample size and airy feel. The lightwood furniture, tile floors and large terrace are perfect for setting the relaxing beach tone for your trip. With three bedrooms and three baths there is plenty of room for large families or several couples to come enjoy this beautiful home. The terrace has dining for six with relaxing palm trees surrounding you. Take the stairs down a level and you are met by a sparkling pool and remarkable ocean view. Whether eating outside on the terrace or swimming in the pool you will be able to watch the boats and yachts below. If you are feeling adventurous, you can take a short drive and enjoy the beautiful beaches of Flamands and Colombier. The view of Gustavia Harbor! 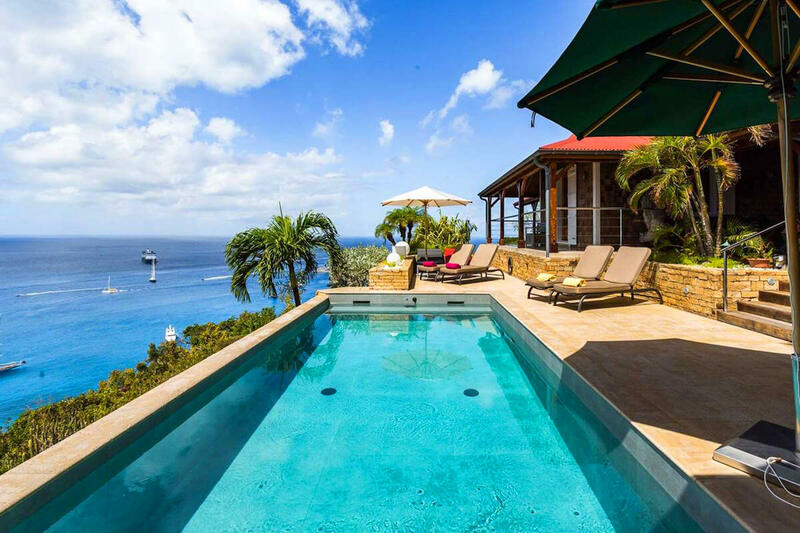 Hurakan Villa sits on the heights of Columbier with an exceptional view of the ocean, the sunset, and Gustavia Harbour. The home has a light, airy feel that mimics the tropical surroundings. Sun addicts will love the pool and terrace, which receive nonstop sunshine throughout the day. At night, the ocean view is magnified by the reflection of lights from yachts in the harbor. Palm trees offer shade to several loungers around the pool, and guests have several seating options under the covered veranda. A dining table welcomes al fresco feasts cooked on the gas BBQ grill, and a private path leads to a look out deck below the main villa. The living room makes use of an open floor plan to create cohesion between the entertainment area and dining area. Guests may read a book from the small library, or catch up on the year’s blockbusters from the flat screen TV. A few steps away, the kitchen is equipped with large and small appliances, such as a dishwasher and blender. Each of the villa’s three bedrooms feature ensuite baths, air conditioning, TVs, and exterior access. Two bedrooms have a queen-sized bed, and the third bedroom has two twin beds. St. Barts’ capital, Gustavia, is five minutes away by car. Here, guests can find world-class restaurants, boutiques, and spas. One of the largest beaches on the island, Flamands, is a 10 minute drive away. This beach is known for its calm waters, great snorkeling, and white sand.